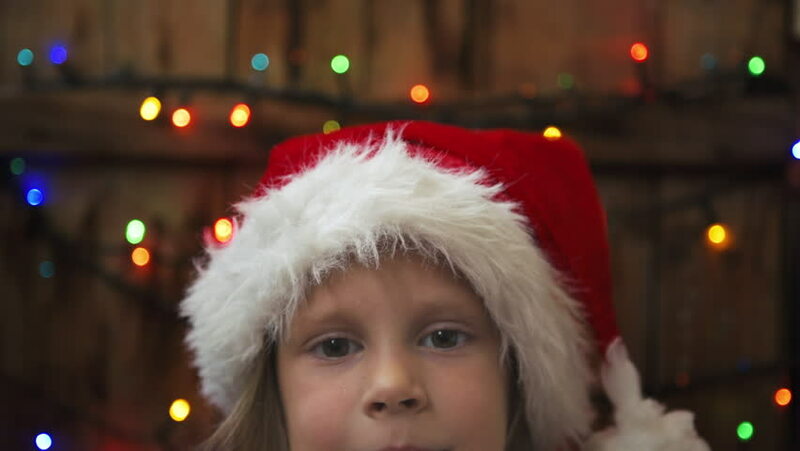 Cute happy girl wearing Christmas hat putting on optical glasses. hd00:14Pretty smiling child looking at falling confetti over Christmas lights background. hd00:20Close-up: Santa Claus on the background of the Christmas tree. hd00:12Adorable little girl in Santa hat licking Christmas candy. Happy child celebrating winter vacation. hd00:07Funny footage of young woman with little daughter lying on the floor looking at each other in eyeglasses. hd00:13Pretty girl waking up in the morning and yawning in bed. hd00:10Happy child in Santa hat holding paper house, dreaming of new home. hd00:13Young mom with little daughter changing eyeglasses with each other. Eyecare concept. hd00:12Cute little girl in curlers and princess dress doing makeup, looking in mirror. hd00:05Pretty smiling girl wearing glasses thinking of new idea and laughing. Cute kid on the floor at home.